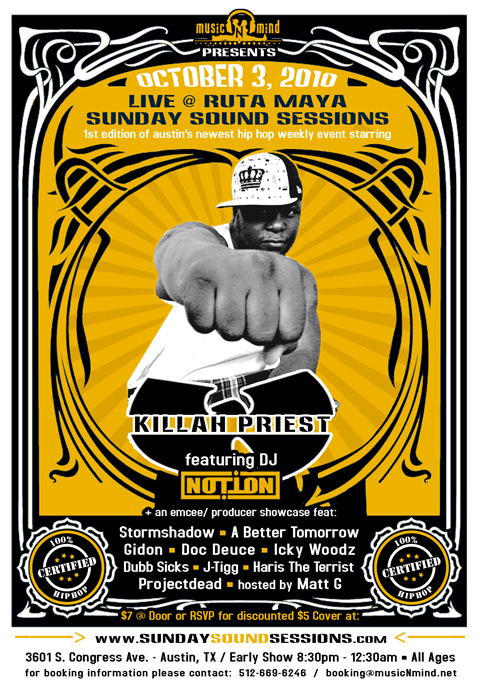 From the Kindle Rulez department... DJ Notion starts up a new weekly Sunday Sound Sessions with Killah Priest @ Ruta Maya tonight, Oct 3rd! 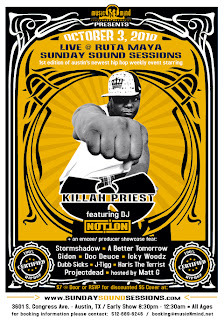 Walter Reed, better known as Killah Priest, Iron Sheik From The Middle East or Masada, is an American rapper and affiliate of the hip hop group Wu-Tang Clan. He is known for intensely spiritual lyrics loaded with metaphors and religious references. He is also connected to the Black Hebrew Israelites (specifically the Israeli Church of Universal Practical Knowledge) and the Nation of Gods and Earths (Five Percenters) through his rhymes, and is known for controversial and Afrocentric subject matter. He is also a part of supergroup The HRSMN along with: Canibus, Ras Kass, and Kurupt.